Many women question the safety of taking dietary supplements while pregnant. Diindolylmethane, or DIM, is a product of a compound found in cruciferous vegetables such as cauliflower, broccoli and cabbage. As a dietary supplement, DIM might be beneficial for various health conditions. Although DIM found in dietary sources generally is considered safe, scientific evidence on the effects of medicinal amounts during pregnancy is lacking. Consult your obstetrician or midwife before taking DIM supplements while pregnant. DIM is created when indole-3-carbinol, a compound that occurs naturally in Brassica vegetables, is digested. Brassica vegetables include cabbage, broccoli, kale, Brussels sprouts and cauliflower. As a phytochemical, DIM has shown potential as a treatment option for various health conditions. According to the Diindolylmethane Information Resource Center, associated with the University of California Berkley, the phytochemical is a powerful modulator with anti-cancer and immune enhancing properties. DIM supplements come in liquid, powder, capsule and tablet form. DIM might help prevent certain types of cancer, including cervical, breast, uterine and prostate. Current scientific research is necessary to determine whether the phytochemical has cancer-preventing properties. DIM also might modify estrogen metabolism and inhibit cervical dysplasia. A 2009 study published in "Cancer Epidemiology, Biomarkers and Prevention" found that DIM prevents the development of cervical lesions and delays the progression of cervical cancer from cervical dysplasia in mice. Although DIM appears to block some of the effects of estrogen, it might enhance other estrogen effects. Other proposed benefits include enhanced sexual function in males and females, anti-aging effects and protection against damage caused by free radicals. More scientific research on human subjects is necessary to determine the validity of these claims. Although there are no known side effects of DIM supplements, this does not mean that none exists. Because scientific research on the safety and efficacy of the supplement is lacking, little is known about the risks associated with DIM. According to eMedTV, the supplement might affect certain liver enzymes responsible for the breakdown of various medications, toxins and hormones. DIM might be unsafe during pregnancy due to complex interactions that occur with testosterone and estrogen. The disruption in hormones might affect fetal development. Because safety has not been established for pregnant or nursing women, avoid DIM supplements during pregnancy unless under the guidance and direction of a knowledgeable health care provider. 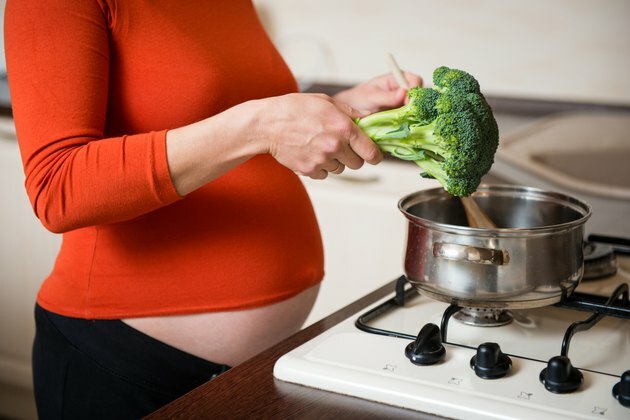 The small amount of DIM produced by the body after consuming cruciferous vegetables is considered safe during pregnancy. Do not take DIM supplements if you have liver disease, kidney disease or a history of cancer.